Whether your customers are dining in or grabbing takeout, you'll be able to complete any meal with this Italian dressing! It fuses the flavor of zesty red bell pepper, leaf oregano, and crushed basil in oil and vinegar to deliver the right amount of light and tangy taste to your customers' food. Italian dressing has a translucent, light orange color and a delicate consistency similar to the consistency of vinaigrette. One of the most popular salad dressings, this flavor-rich recipe is perfect for drizzling over house salads. Mix it into cold pasta salads to add cool, tangy taste! 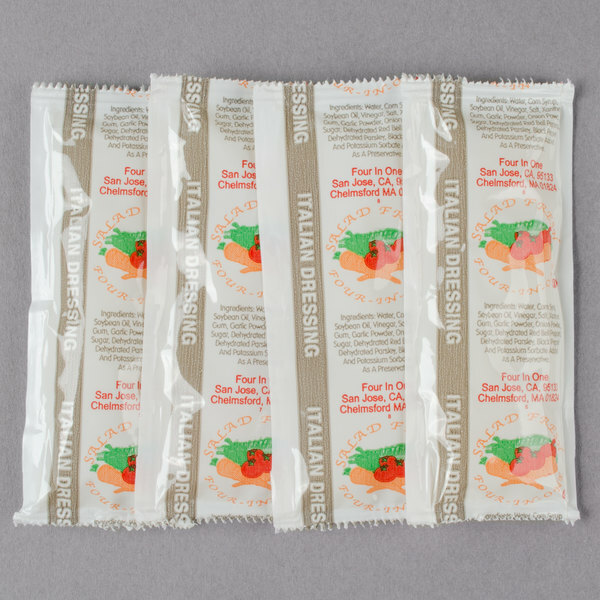 These 12 gram packets of Italian dressing are ideal for delis, restaurants, salad bars, concession stands, and convenience stores. Portion packets keep the product fresh and reduce waste from unused product in bulk containers to help control costs. 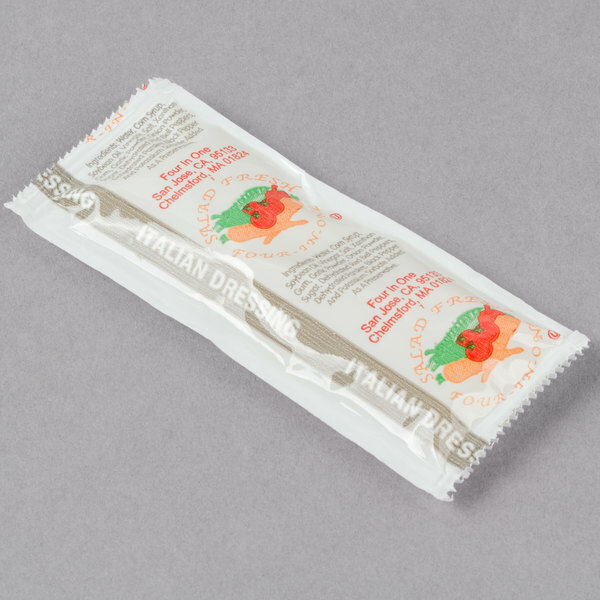 Offer these Italian dressing packets in takeout bags, and they're perfect for the carry-out customer! This is a great value Italian dressing but is a thin dressing. I believe that you would need extra dressing to be able to enjoy the taste of your salad. The flavor of the dressing is rather vinegary but many of my guests enjoyed it despite it's flaws. Thank you for your feedback! We’re sorry you did not prefer this dressing. For recommendations on a better option, please contact our Customer Solutions team! 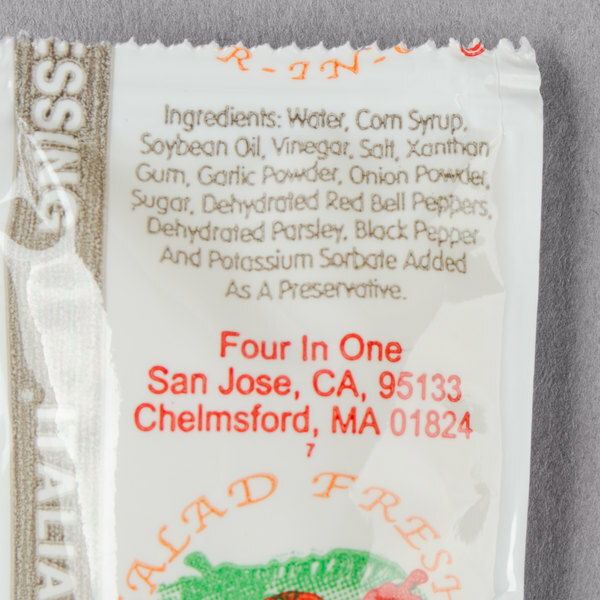 The Italian Dressing is great and the packets make it easy to display on our salad bar. Great tasting and really nice price for the quality. 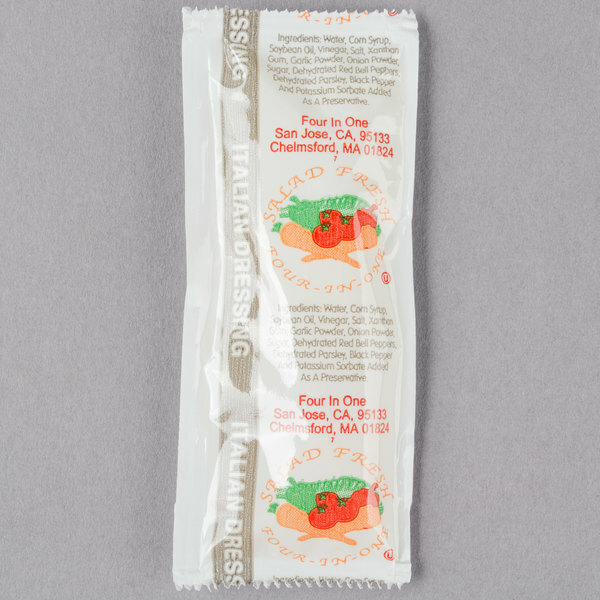 A really nice quality portion packet of dressing that is great for our to go side salads. The Italian is light and has a great oily texture. The dressing is really good on salad and on our meatball subs. My customers love the taste of this Italian dressing and it is for a great price on Webstaurant. I really like that it comes in a larger portion package. I love Italian dressing on my sub sandwich. The portion packs are ideal because I can pack them in my lunch to go and put them on the sub at lunch. That helps prevent the bread from becoming to soggy. 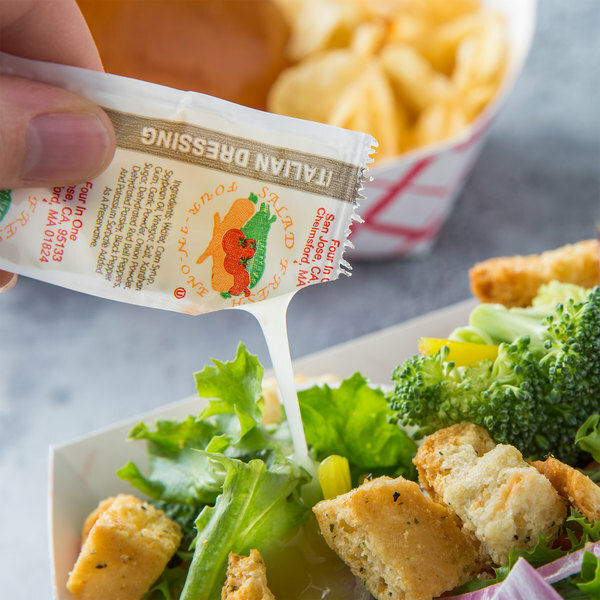 What a convenient way to add dressings to our Salad Box Lunches. No leaking and the perfect portion size. Our customers have told us they taste great too! Pretty decent, can't say it's the best Italian dressing I've had but for convenience purposes, this serves the job very well. Easy to use as well. Great product! Great for portion control. We have used them for salads and for sandwich condiments. They are very convenient. I will purchase again for our lunch caterings. Perfect addition to grab and go hoagies so the rolls don't get soggy! Good flavor and not too salty or flat in flavor. The price makes these even better! After our supplier changed the recipe on our other dressing (for the worse) I tried 2 other suppliers to find a replacement 12 gram Italian but I could not. Tried a case of this and we love it, much better! It is served on the side with our oven baked subs. Perfect portion size for a small salad. I'm serving salads out of the 24oz containers I buy from here so I'll probably give my customers a couple packets, just to be sure. Great flavor! Budget friendly! 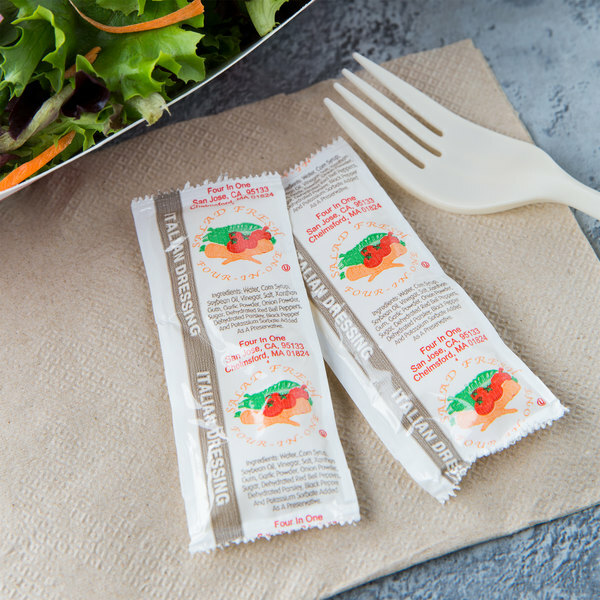 these dressing packets are perfect for take-out items in our cafe. They work great for subs or sandwiches, they are small so not as much wasted product. So excited to use these for my wedding in a couple months. The price is amazing for how many packets you get and they seem like the perfect size for a side salad.